December | 2015 | Namaste to you, Sir! 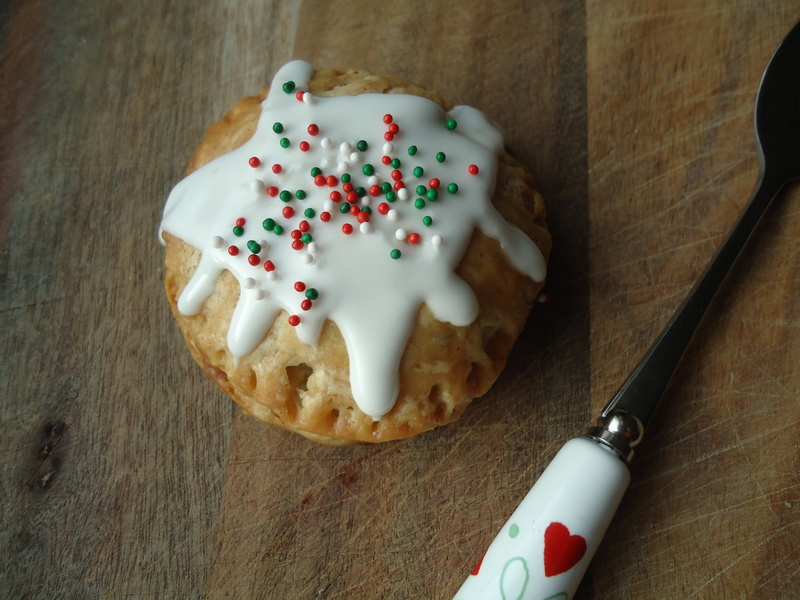 Time to bake Mince Pies! 2015 has been quite a hectic year and with 2016 fast approaching, I decided to drag at least one recipe from oblivion and re-post it here, this is more as a way to feel that I did, indeed, do something about the blog before the year’s end, that because I’m desperate to write today. 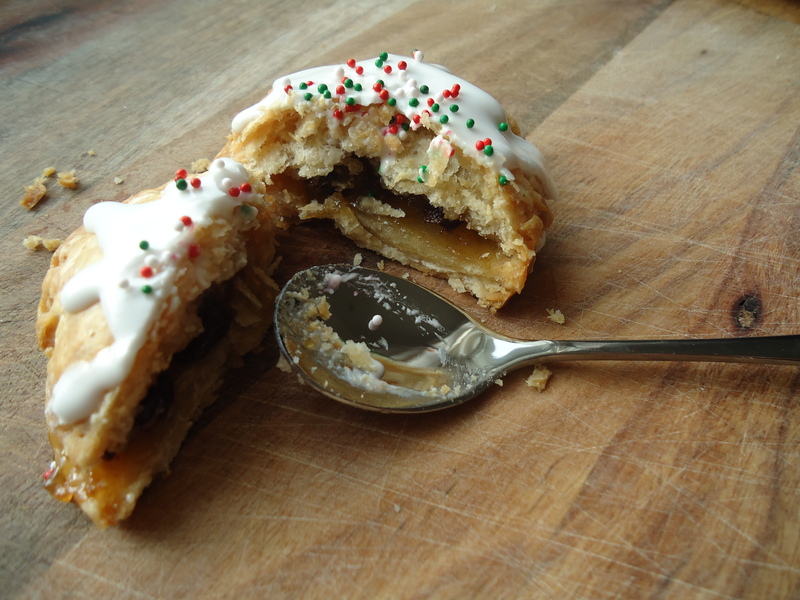 I think the best thing about these mince pies is the pastry, you can use the same mix to make really, really delicious apple pies (I highly recommend them). I love to keep things traditional during Christmas, at home we eat Pan Dulce (an Argentine cousin of Italian Pannetone), and even though everyone seems to be falling for it, I refuse to buy those chocolate chips pan dulces that are popping everywhere. Chocolate chip? On my pannetone? I don’t think so! So, yes, I understand the importance of keeping the flavours we grew up with during the holiday season. 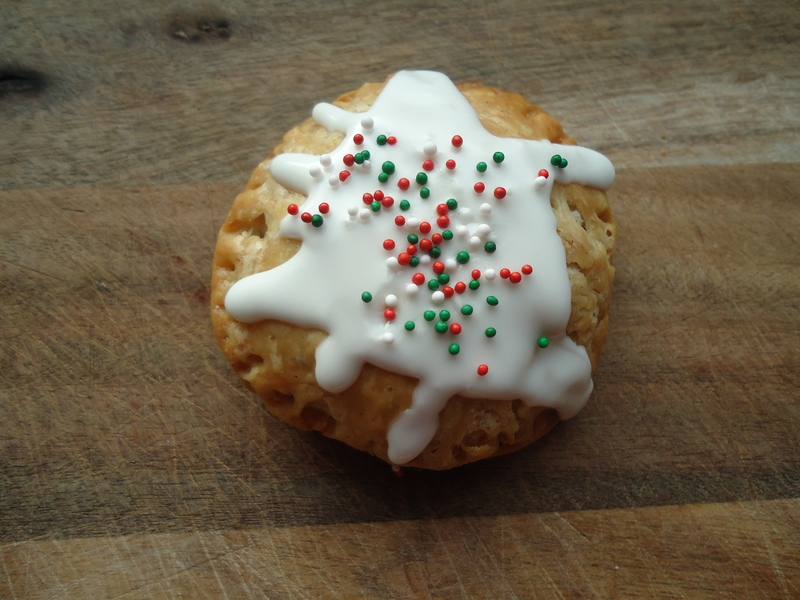 But I’m not against a teeny-weeny tweak here and there, you can call this coconut oil pastry a teeny-weeny tweak. So, without further ado, Christmas is almost on top of us after all, here is the recipe. 1.- In a bowl place the flour and the salt. Mix together and then add the coconut oil. 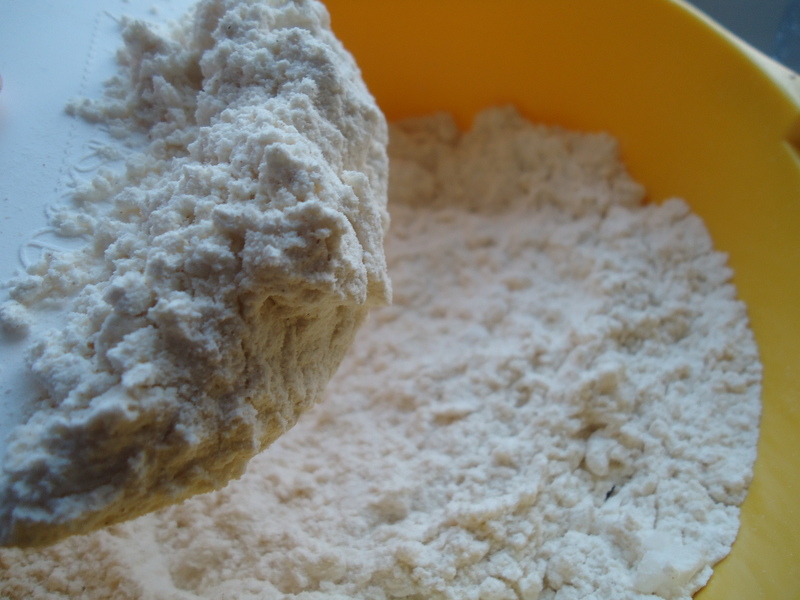 2.- With your fingers rub the coconut oil into the flour mixture until it resembles bread crumbs. 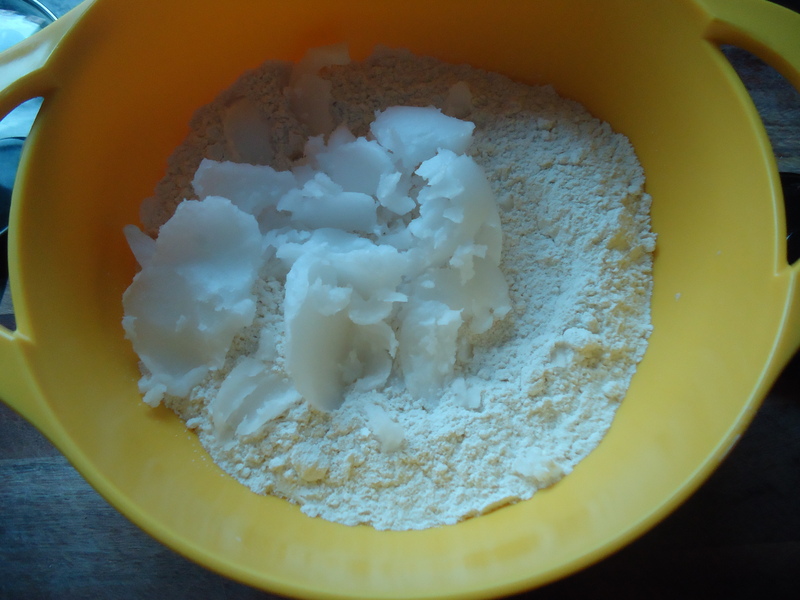 Coconut oil isn’t as pliable as butter, so it is harder to rub it into the flour. The little lumps of oil are tougher than their butter equivalents; but be patient, it can be done. I haven’t tried using a blender. 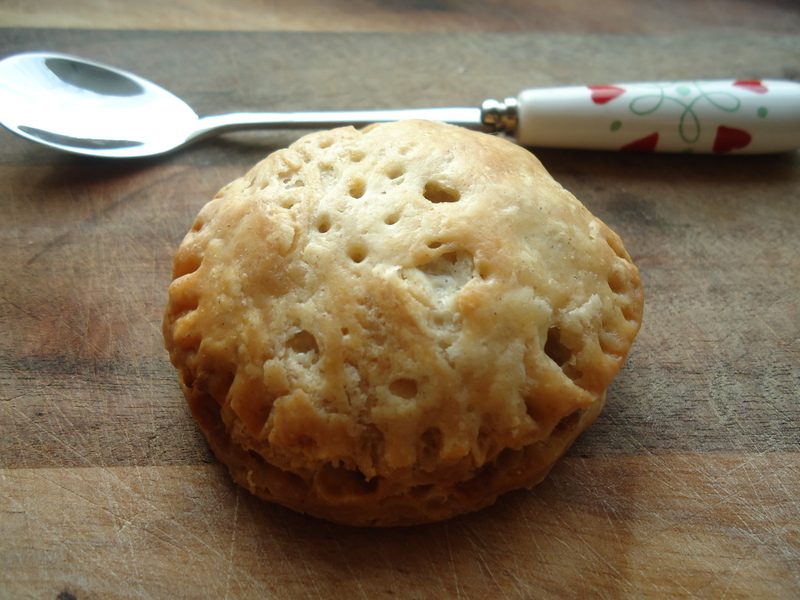 You can try it though, and if it works, then making these pies will be a breeze. 3.- Make a well in the centre, add the egg yolks, vanilla essence and the water. 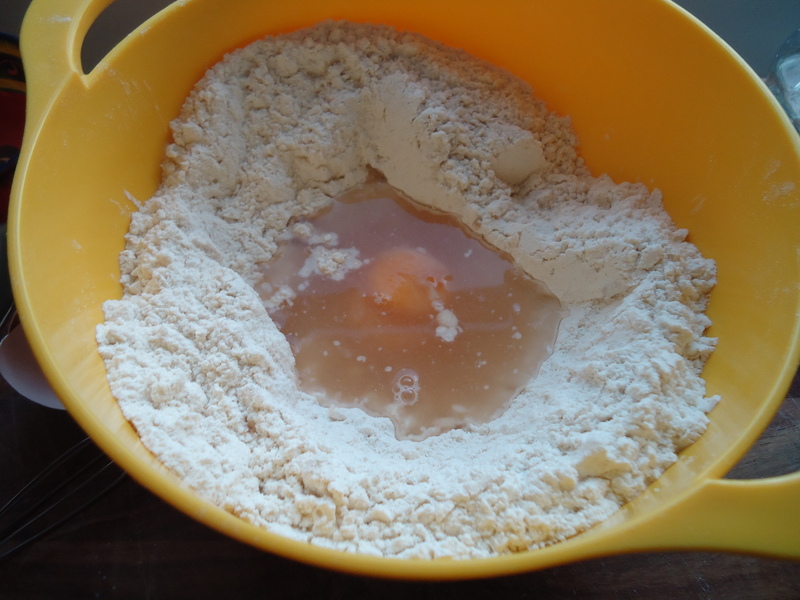 4.- Mix everything by hand until you have a dough that comes off the sides of the bowl. Don’t overwork the dough or it will make a tough pastry. Just mix enough for the wet ingredients to permeate the dry ones and then press everything together to form a ball. 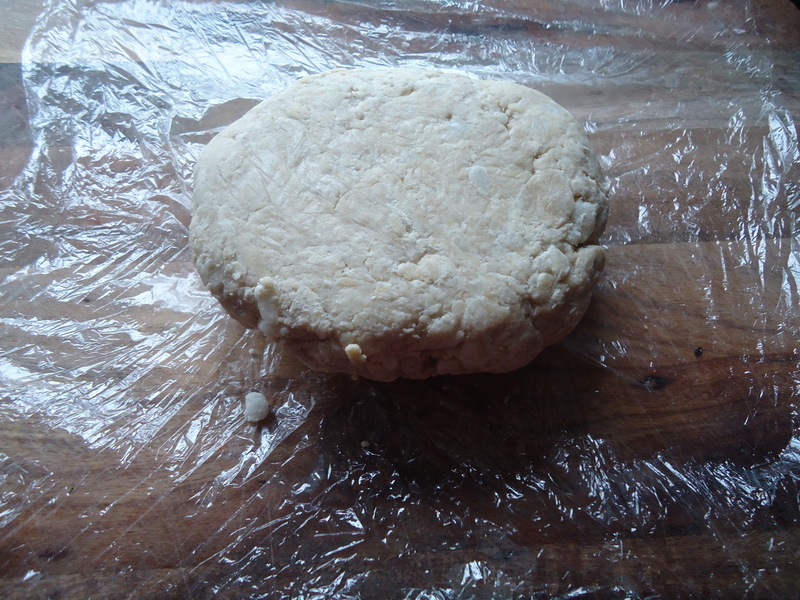 5.-Wrap the dough in cling film and place in the fridge for 1 hour, ideally for 2. 6.- After 1-2 hours, take the dough out of the fridge. 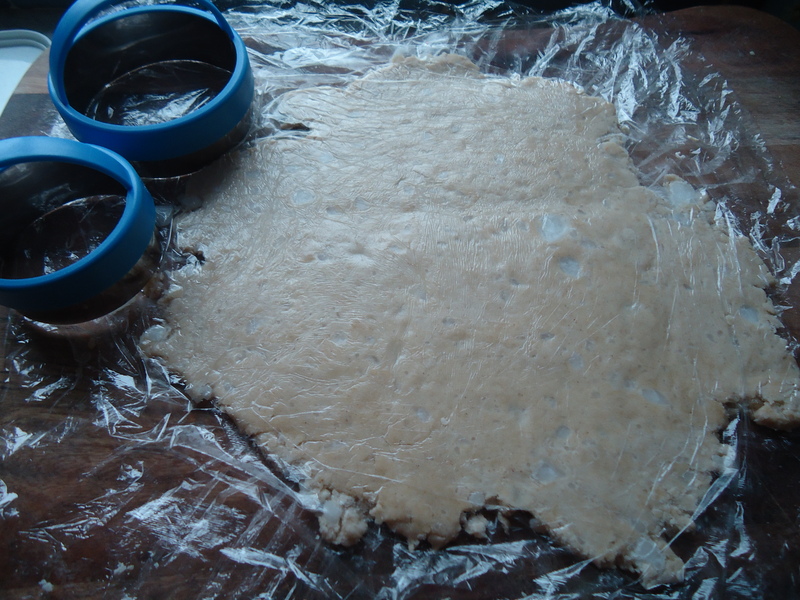 You can then lightly flour a surface and roll out your dough; or you can spread a rectangle of cling film on your working top, place the dough on it, and then cover loosely with another cling film sheet and roll out the pastry through the cling film; that way, the dough doesn’t stick to the rolling-pin and you avoid using too much flour, which will also make your pastry tough. Roll out to a 3mm thickness. 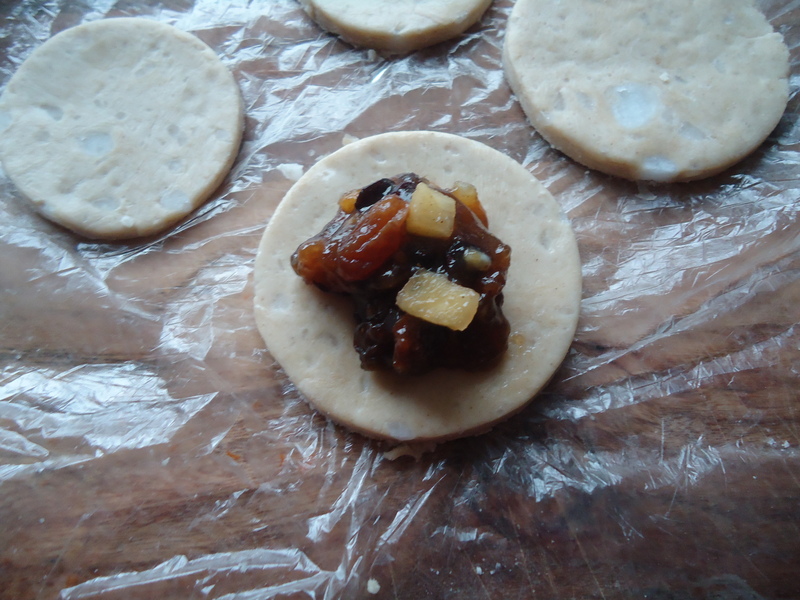 7.- Cut circles of 4-5 cm diameter, depending on the size you want your mince pies to be. Try not to make them too big that they are difficult to eat, or too small, because they won’t take enough filling. 8.- Spread 1 -2 teaspoons of filling into one of the circles, then paint around the edges with a bit of water or egg white so that the top of the pie will stick to the bottom. Take a second circle, prick it with a fork and place on top of the filling. 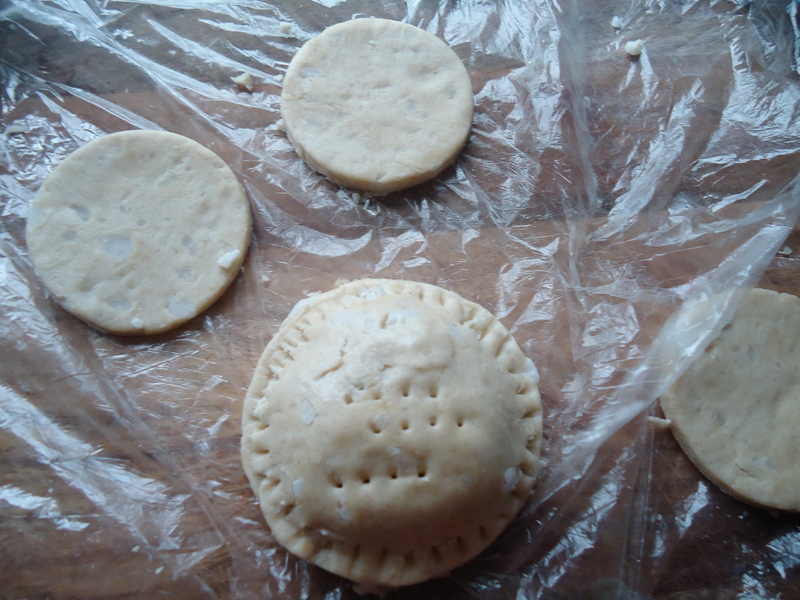 9.- Use a fork to press the edges together and seal the tarts…. 10.- Continue with the rest of the pastry. 11.- Place in the fridge for 30 mins and then bake or freeze them wrapped in cling film. 12.- To bake them: Preheated your oven at 200 C. Place the pies on a baking tray covered with baking paper and bake for 20 minutes or until golden. 13.- You can prepare a simple glaze with 1/2 cup of icing sugar and 1 teaspoon lemon juice to cover them once they are cold. If you want your icing to be super white, like in the photos, the add 1 teaspoon of egg whites to your icing sugar/lemon mix and whisk everything together until soft and fluffy.